Anchorage is a large and popular city in Alaska, located to the south of the state. 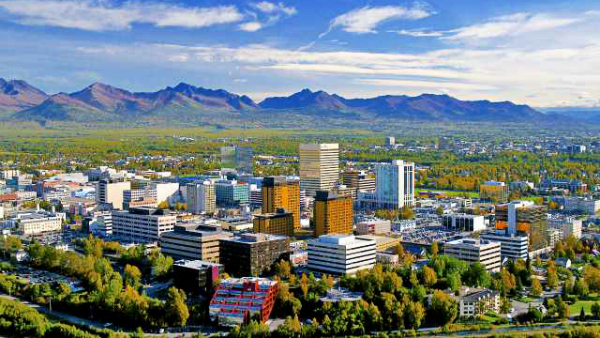 Anchorage is not only the most populated city in the Arctic area of the United States, as well as an attractive tourist complex full of parks, winter recreation centers and large zoos. The entertainment in Anchorage is mixed. However, the high class restaurants, museums and musical events stand out. On the outskirts of the city, its lakes, glaciers and immense forests are the most popular attractions. Anchorage has much-visited sites such as Cook Inlet, Lake Hood, Chugach State Park, Alyeska Resort, Alaska Zoo and Chugach National Forest. The city is one of the coldest in the United States, so it is advisable to visit Anchorage in April when there are less rain and snow. The Ted Stevens Anchorage International Airport, which is south of downtown Alaska, connects it with the rest of the country and even the world since it has important international airlines. To move around Anchorage, there is a bus system called People Mover, with its the main station in the center of the city. The old Alaska Railroad system, exclusively for tourists, complements the transportation system, as trains leave the station to the south, Whittier, Seward, Talkeetna, Denali Park, and Fairbanks. The Downtown is the recommended area where to stay in Anchorage (See accommodation in Downtown Anchorage) due to its proximity to the best entertainment in the city. Here’s a guide with the best areas to stay in Anchorage. Downtown Anchorage, also known as the business district of Anchorage, extends through the central area of the city to the Knik River coast. The Downtown brings together a series of offices, large buildings, shopping centers, restaurants, and the best nightlife in Alaska. The architecture in Downtown Anchorage is well represented by the ConocoPhillips and Atwood buildings, known as the largest in Alaska. Next to Downtown, is the busy Anchorage Museum, among the most visited attractions in the state. The Alaska Railroad Depot is the district’s main train station at the north end, from which the Denali Star semi-luxury trains depart, a popular transportation for tourists. 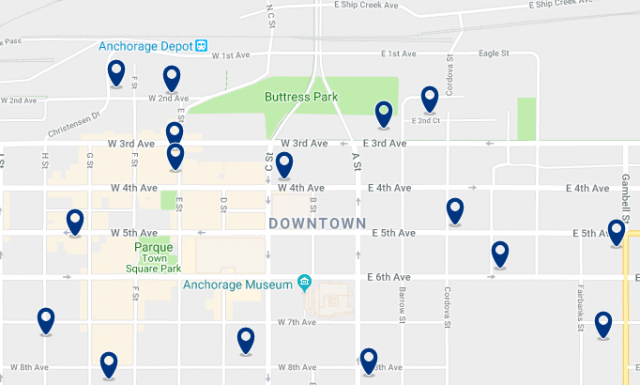 Staying in downtown Anchorage is the best option due to its location, good hotels and public transport connections, among other benefits of the area. The Downtown district is also among the best areas to stay in Anchorage for business travelers and young travelers looking to discover the nightlife of the city. This Anchorage hotel offers live music on Thursdays and Saturdays and is less than a 1-minute walk from the shops at 5th Avenue Mall. The Clarion Suites Downtown is located in the very center of Anchorage, just a short walk from several attractions, such as the Visit Anchorage tourist office, the Dena’ina civic and convention center. This luxury hotel is located in downtown Anchorage, 7 blocks from the local Museum. 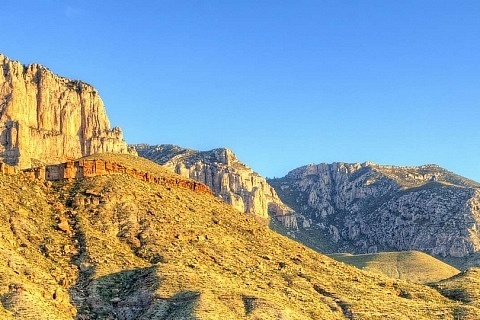 It has 4 restaurants, a conference center, 15 shops and spacious rooms with a flat-screen cable TV. East Anchorage and the University of Alaska are located in the U-med district, southeast of the city. It is an area famous for its educational institutions and research centers, among which the UAA (University of Alaska Anchorage) stand out. 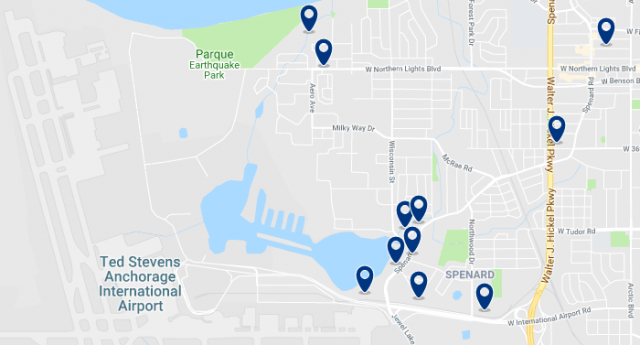 Other attractions of the so-called Anchorage school district are the planetarium, large libraries and parks such as Sitka Street, Woodside Park and Goose Lake Park. The area is 10 minutes by car from downtown, with most of its bus stops on Providence Avenue. 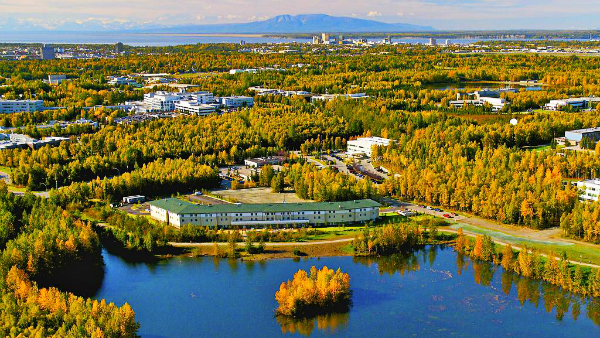 The U-med district, as well as the East Anchorage and the University of Alaska surroundings, have a large number of 3-star hotels, apartments and student residences. It is one of the best areas to stay in Anchorage to reduce costs, or to enjoy the school district, museums, and galleries. 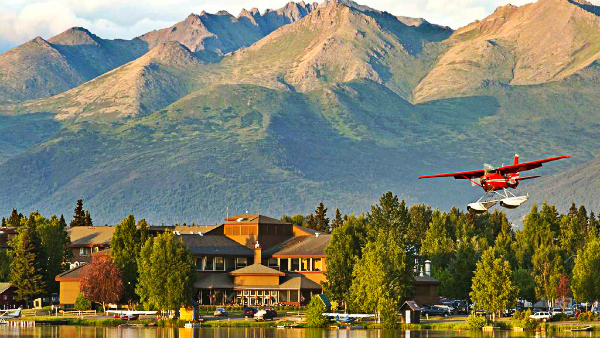 Nestled at the base of Chugach Mountain Range, this hotel offers panoramic views of University Lake. It features an indoor swimming pool and a hot tub. Esta posada de Anchorage se encuentra a 6,4 km del aeropuerto internacional Ted Stevens Anchorage y ofrece un desayuno continental. The Ted Stevens Anchorage International Airport is located 4 miles from the city center, just southwest on Cook Inlet Bay. Not only is it the largest airport in Alaska, but it is also the one with the highest passenger traffic, reaching 5 million visitors per year. It has one of the operations centers of the well-known airline Alaska Airlines, as well as other important airlines to Asia and Zurich, among others. The surroundings of the Ted Stevens are well supported by the People Mover bus service, which distributes routes on the outskirts of the airport. 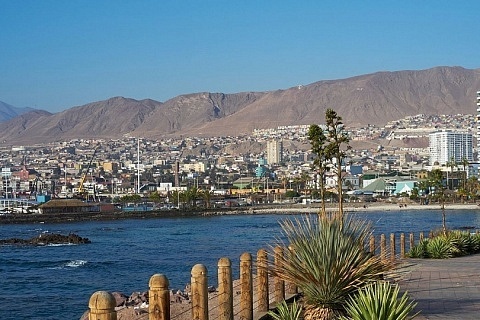 Several hotels installed in this area offer complete Wi-Fi services, ATMs, restaurants, shops and luggage storage. From the Ted Stevens International Airport, you can opt for air tours to observe the marshy areas or fly over the mountains and glaciers. The hotels installed in the vicinity of the airport are ideal for those who make a stopover or travel for business, which makes this place one of the best areas to stay in Anchorage. Overlooking Lake Hood, this Anchorage, Alaska hotel offers warm rooms with free Wi-Fi and cable TV. A transfer service to Ted Stevens International Airport is offered. Long House Alaskan Hotel is 1.4 miles from Ted Stevens Anchorage International Airport. 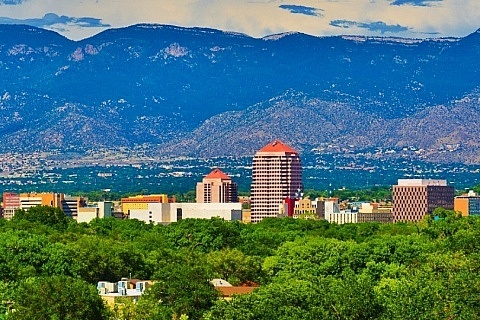 It offers free airport shuttle service, a business center and laundry facilities. Located in Anchorage, Alaska, Frenchy’s Adventure Bed and Breakfast offers a fully equipped shared kitchen. This B & B offers free Wi-Fi and parking.